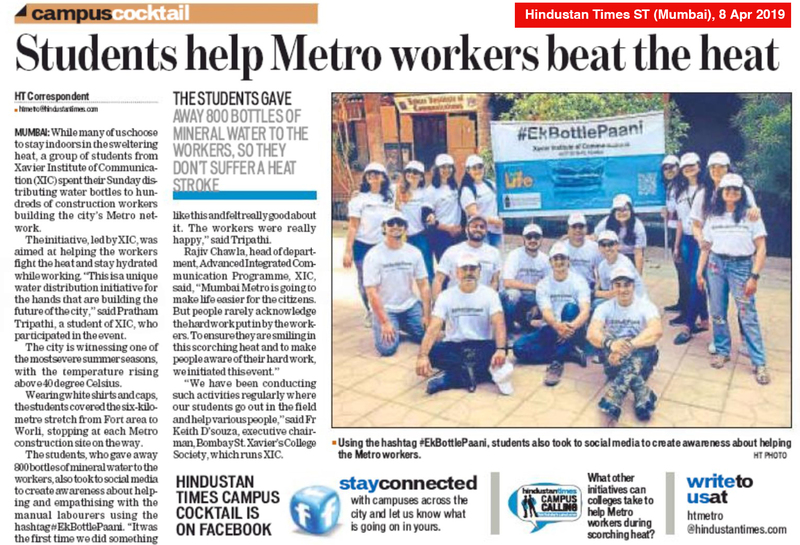 The AICP batch of Xavier Institute of Communications organised a unique and compassionate initiative titled EkBottlePaani on Sunday starting from St. Xaviers College till Worli covering 6 kms of stretch. It aimed at engaging with the Metro workers, the people on ground under the sun and help them fight the heat and stay hydrated. The effort is to evoke a sense of appreciation and empathy in the masses of the city, for the people on ground, and encourage each of us to carry this thought and provide them a bottle of water. This is a unique water distribution initiative for the hands that are building the future of this city, to help them beat the heat this summer.